NOTES: Includes a set of crew figures. The M4 Sherman was the most widely produced American tank of WWII, and it equipped several Allied armies. The M4A4 was generally either exported or used in the US by training units, but did see some action in the hands of US Army crews. The M4A4 was gasoline powered and while their has been speculation that the diesel engine tanks were safer, there has been no hard evidence to back that claim. One interesting note is that after questioning German tank gunners, it was found that the scabbed armor added to protect the tank more was actually used as an aiming point by the opposition! This is the second kit in Cyber-Hobby's 'Value Pack' line. From what I can see, it offers a set of crew figures to augment one of their kits. Judging from the MSRP, these kits also provide some savings as well. The Dragon Sherman is a kit that has been around for a bit, and constantly upgraded with refined bits and pieces. 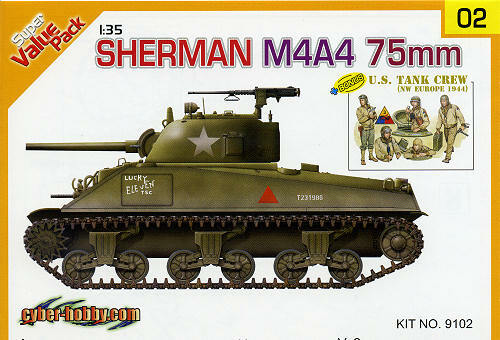 This means that today's Sherman kit is a more accurate one than the initial boxing from several years back. Even with this kit, there are some upgraded parts. Specifically the turret casting and the suspension and wheels. 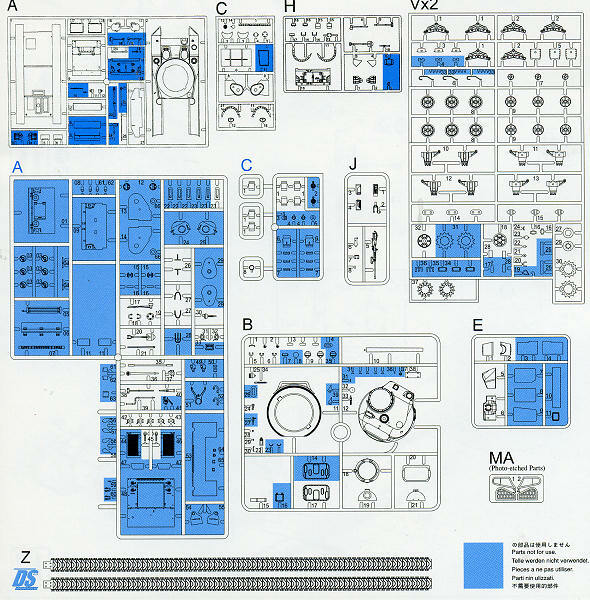 This kit also has a set of those great DS tracks, so no time consuming individual links to sweat out. In fact, this could almost be considered a 'quickie build' in the armor line as there are a mere 250 parts, much of this thanks to the single piece tracks. That is not to say that the kit is without options. There are some included in the instructions, but they are minor things like the interior hatch design, for instance. The builder will also have to trim away the beaded rain deflector from around the hull machine gun, but that is about it. The kit is also quite light on photo etch. Only some tail light screens and a thingie (I'm sure there is a military designation for this bit) to the right of the gun mantlet are done in photo etch. Instructions are a bit of a surprise as well. Instead of the usual huge sheet, you get one that seems more at home in a 1/72 armor kit. Still, it covers everything and not only is it in color, but has the painting guide for the box art tank and the figures included. Usual Gunze and Model Master paint references, of course. The small decal sheet is minimal and has markings for a tank operating in Burma during 1945. One assumes that the uniforms for the 'NW Europe: 1944' figure set would be appropriate for the Burmese jungle. 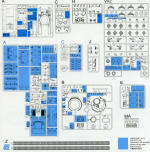 Thanks to this kit, you now get not only great Sherman kit, but a nice set of five figures to go along with it. Two of the figures are only waist up so that they can be modeled in the open hatch of the tank. This and others in this series are of the 'one time release' category so it would be a great idea to grab one now while the getting is good.